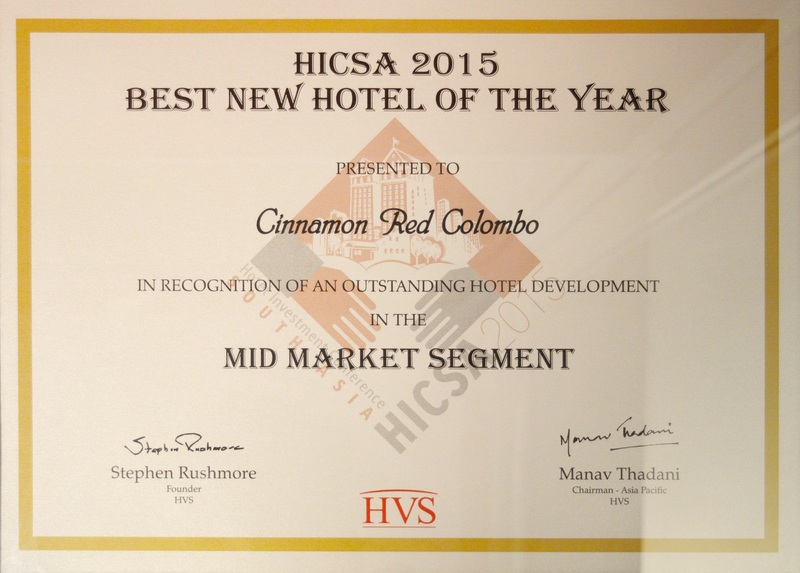 Cinnamon red Colombo, part of the dynamic Cinnamon Hotels & Resorts chain, won the ‘Best New Hotel of the Year’ award in the ‘Mid-Market’ segment at the 11th Hotel Investment Conference – South Asia (HICSA) 2015, held on the 7th and 8th April 2015, in New Delhi, India. The prestigious annual HICSA ‘Hotel of the Year’ awards were instituted to honour and recognise the most outstanding hotel developments in the region for the past year. Hosted by HVS Asia, a dedicated hospitality consulting firm, the conference provides a highly respected platform for new hotels to gain prominence. Winning this award reaffirms that Cinnamon red is perfectly positioned to cater to the demands of the new age travellers – the new millennials – and due to its strong brand presence, especially in the South Asian region, provides a unique experience for its guests. Terrence Fernando, General Manager of Cinnamon red Colombo received the award on behalf of Cinnamon red at the awards ceremony held on 7th April at the JW Marriott Hotel New Delhi. In its published report on Sri Lanka’s hospitality sector, HVS noted that the launch of Cinnamon red Colombo presents an excellent opportunity to tap into the burgeoning mid-market outbound traveller segment, primarily from India and China. The new, emerging breed of discerning travellers seek the assurance of a hotel that understands and anticipates their needs, while providing the right amalgamation of comfort, efficiency and convenience – the precise concept of Lean Luxury which Cinnamon red is pioneering. 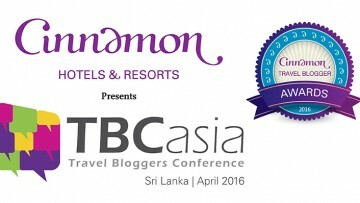 By adapting to the growing needs of this segment, Cinnamon red has yet again emerged as a preferred choice for travellers, more recently winning a Booking.com award for guest satisfaction as well. 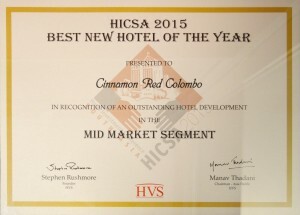 “Winning the HICSA award in the Mid-Market category is an immense achievement for Cinnamon red Colombo, as it has been in operation for a little over six months. This is yet further proof that Cinnamon red is fast gaining visibility and generating a buzz in the South Asian region, clearly reflected in the high number of votes it has received to go on and secure this award. We envisage Cinnamon red emerging as one of the foremost hotel brands in the mid-market segment in the region in time to come. The South Asian region is a key market for tourism in Sri Lanka and we expect Cinnamon red to command pride of place and establish itself as a destination in itself”, said Rohan Karr, Sector Head for City Hotels. “I am delighted that Cinnamon red Colombo has been awarded the Best Hotel of the Year in the mid-market segment at HICSA 2015. 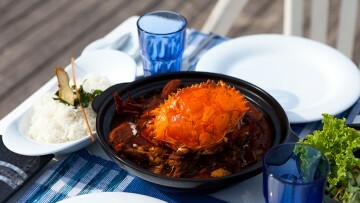 Cinnamon Hotels & Resorts has aspired to carve a unique niche for each of its tiers and Cinnamon red was conceptualized to cater to a select segment. Cinnamon red introduced the concept of ‘lean luxury’ to Sri Lanka, in response to global hospitality trends, thereby fulfilling a long-felt need for a quality hotel at an affordable price. We are confident that Cinnamon red heralds a new benchmark both for Cinnamon Hotels & Resorts and the lean luxury category in the country, and is poised as the game-changer in Sri Lanka’s evolving tourism industry. 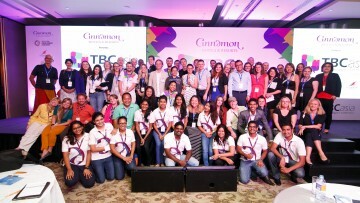 The Cinnamon red team needs to be commended for delivering the brand promise with panache”, said Terrence Fernando, General Manager of Cinnamon red Colombo. The HICSA awards 2015 had received 44 nominations for ‘Hotels of the Year Awards’ in the Luxury/Upper Upscale, Upscale/Upper Mid-Market, Mid-Market and Budget/Economy categories. Cinnamon red Colombo emerged the winner from three finalists, the other two contestants being Mirage Lords Inn Kathmandu and Ozo Colombo. Awards are given based on a voting system, and registered delegates, who are from the hospitality industry, are allowed to vote. 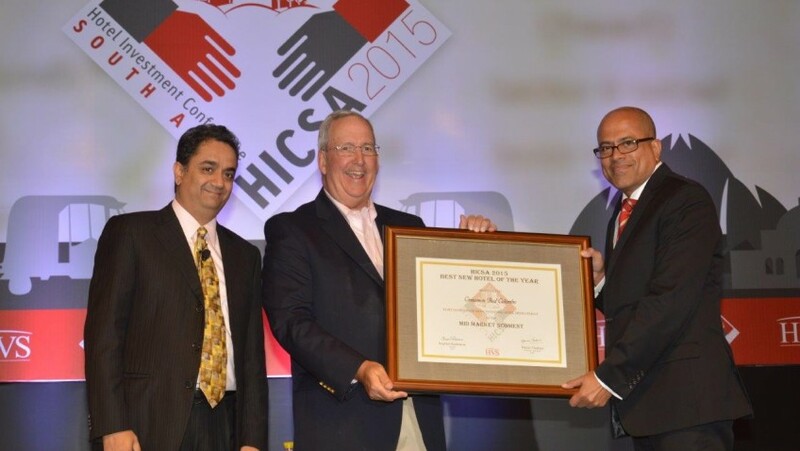 HICSA attracts about 500-600 attendees annually for its conference.